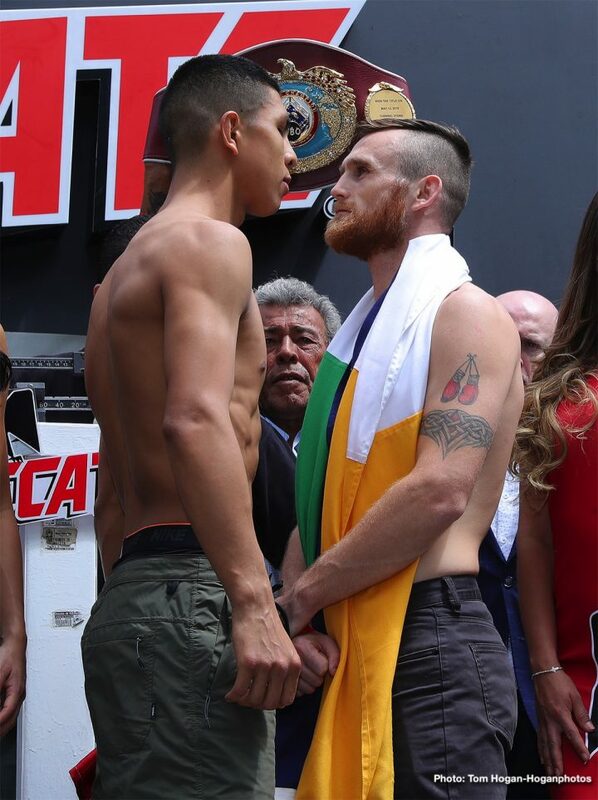 By Allan Fox: Jaime Munguia will be defending his WBO junior middleweight title tonight against mandatory challenger Dennis Hogan on DAZN starting at 8:00 p.m. ET at the Arena Monterrey, in Monterrey, Mexico. Munguia (32-0, 26 KOs) is hoping to put in a good performance to continue to increase his fan base. He’s got an unknown on his hands in 34-year-old Hogan (28-1-1, 7 KOs), who was the mandatory challenger by the World Boxing Organization last year after defeating ‘Jimmy’ Kilrain Kelly by a 12 round unanimous decision in April 2018. Hogan, 5’8″, is going to need to find a way to handle the big size and power advantage of the 5’11” Munguia. This isn’t an ideal match-up for the weaker punching Hogan. He can’t afford to stand his ground for any length of time against Munguia, otherwise he could wind up being run over by a freight train. Munguia is someone that could be a superstar in the near future. He’s shown the kind of talent that will enable him to be a major player when he moves up to middleweight in 2020. Munguia figures to be facing the lions in the 160 lb weight class soon in fights against Gennady Golovkin, Saul Canelo Alvarez, Daniel Jacobs and Demetrius Andrade. Munguia has expressed interest in wanting to fight GGG in 2020. Golovkin’s trainer Abel Sanchez said that if they don’t get the trilogy fight against Canelo Alvarez in September, then Munguia is a possibility for him. Golovkin and Munguia were supposed to have fought each other last May after Canelo was suspended by the Nevada State Athletic Commission for testing positive for the performance enhancing substance clenturol. However, the Nevada State Athletic Commission failed to sanction the Golovkin-Munguia fight, noting that Munguia lacked the experience at middleweight for him to be a suitable opponent. Golovkin wound up facing junior middleweight Vanes Martirosyan, who he wiped out in two rounds. Munguia turned around and challenged WBO junior middleweight champion Sadam Ali, and wiped him out in four rounds. This could be the last title defense for Munguia at 154, as he plans on moving up to 160. He’s not made a firm decision yet whether he’ll make one more defense of his WBO junior middleweight title before he moves up to the 160 lb weight class. If Munguia does stick around for one or two more fights at 154, he’ll likely defend against Jessie Vargas, and then possibly Kell Brook. Those will be good fights if they happen. Munguia’s popularity has been skyrocketing ever since his four-round destruction of former WBO 154 lb champion last year in May. Munguia’s co-promoters at Golden Boy Promotions were pleasantly surprised with his big win over Sadam, and they’ve kept him really busy in scheduling him with three title defenses against former WBO 154 lb champion Liam Smith, Brandon Cook and Takeshi Inoue. Munguia won all three fights, and looked good for a 22-year-old without much experience. Munguia won those fights with the help of his size, youth and brute strength. Liam Smith might have had more boxing skills, experience and a better ring IQ, but he didn’t have the raw strength that Munguia brought to the table. That was the difference in that fight. Going into the championship rounds, it unclear who was going to pull out the win. But Munguia switched into overdrive and dominated the last four rounds of the fight to get the victory. Hogan is from Ireland, but he now resides in Australia. He’s done well during his career in winning most of his fights. His only loss came at the hands of Jack Culcay in a 12 round unanimous decision in December 2015. Hogan also has a five round draw against Edmund Eramiha earlier in his career in 2011. The odds-makers have the smaller 5’8″ Hogan as a big underdog in this fight. Since this is a bit of a step down for Munguia from the guys that he’s been facing lately, he needs to make sure he doesn’t take his foot off the accelerator. There’s going to be a lot of boxing fans that will be tuning in on DAZN hoping to see another impressive performance from Munguia. He needs to make sure he has those fans in mind when he steps foot inside the ring with Hogan. Just because Munguia is fighting a guy that arguably doesn’t rate a world title shot doesn’t mean that he need to take it easy on him. If anything, there’s more pressure on Munguia to make quick work of Hogan in order to show the fans that he can beat the softer opponents the WBO throws in front of him in mandatory defenses. Munguia will need to cut off the ring, and look to take out Hogan in order to keep him from trying to box all night long, which is what he’ll be trying to do.